New Scottish champion Connie Jaffrey (Troon Ladies) obviously took a lot out of herself in winning that title for the first time at Royal Aberdeen last week. The 20-year-old from Kilwinning (pictured right) was only a shadow of the brilliant Balgownie player in the first qualifying round of the British women's open amateur championship at Pyle and Kenfig Golf Club, South Wales this morning, shooting a disappointing four-over-par 75 for a T77 position. 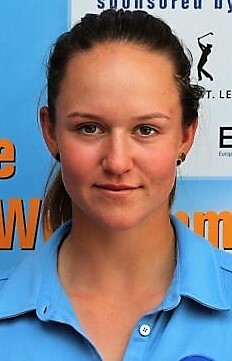 France's Mathilde Claisse is setting the pace with a four-under 67 - two ahead of Irish Curtis Cup player Maria Dunne and My Leander from Sweden. Defending champion Julia Engstrom (pictured left) from Sweden who became the youngest player ever to win the prestigious title at the age of 15 12 months ago, shot 69. Beaten finalist at Balgownie, Clara Young (North Berwick) had a 73 to be T53. 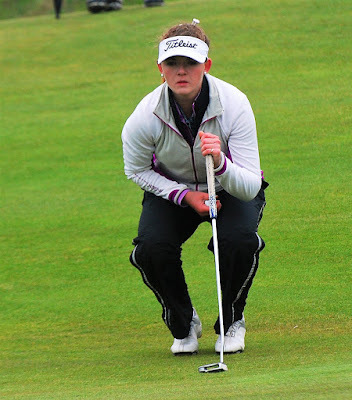 Chloe Goadby (St Regulus), the top seed who was KO'd in the first round of the "Scottish" last week, bounced back to form with a 69, despite a double bogey 7 at the fifth. She had three birdie 2s on her card and also birdied the seventh eighth and 16th. She had bogeys at the 10th and 17th in halves of 35-34. Chloe is T3 with some players still to finish. Sweden's Linn Grant, pictured left, whose grandfather James Grant hailed from Inverness and won the Scottish U18 boys championship in the 1950s before becoming a club pro in Sweden, leads the field with a six-under 65 which included an eagle 3 at the ninth and birdies at the third, fifth,14th, 15th and 18th. Linn, who won the Helen Holm Scottish women's open amateur stroke-play championship at Troon this year, bogeyed the 17th in halves of 32-33. 70 I Wardle (Prestbury), A Belac (Slovenia), C Borge (Norway), P Neira Garcia (Spain), P Grant (Ireland), Leona Maguire (Slieve Russell), R Morris (Woodsome Hall). 75 C Jaffrey (Troon Ladies), G Price (Bude and N Cornwall), A Fuller (Roehampton), E Toy (Carlyon Bay), L Bailey (Kirby Muxloe) (T71).